Award-winning band leader and artistic director, Gary Crosby OBE invites you to The Jazz Salon – a series of intimate encounters on the last Friday of every month at Foyles’ flagship London bookstore on Charing Cross Road featuring live music and fascinating conversations exploring the cultural reverberations of the world’s first sub-culture: Jazz. For our April session, music journalist Kevin Le Gendre (BBC, Echoes, Jazzwise) takes a seat in the salon with poet and DJ, Charlie Dark to consider the enduring connection between music and spoken word. 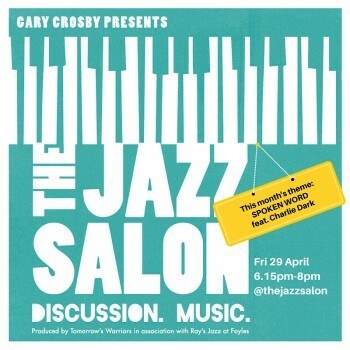 Tracing a line from 1920s jazz poetry, they explore why words and music continue to (re)present revolution, their conversation punctuated by cool, classic jazz in keeping with the theme, played live by Gary Crosby and his superb Jazz Salon House Band. We look forward to welcoming friends of the National Theatre to The Jazz Salon on 29 April.